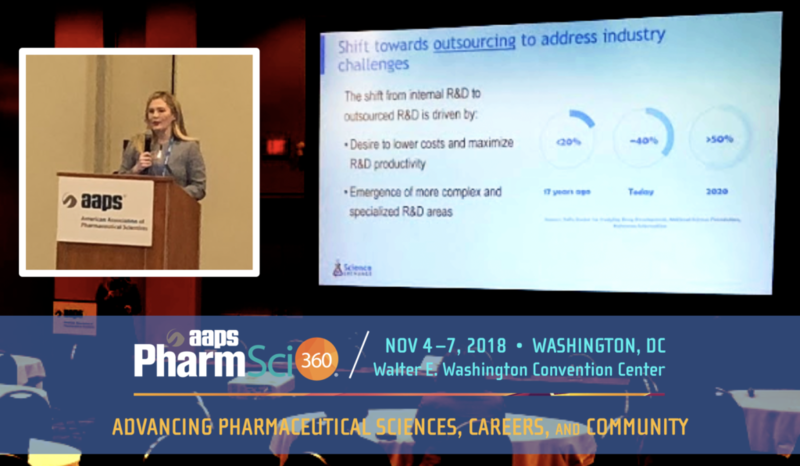 Executives from across the pharmaceutical industry gathered in Washington D.C. at the American Association for Pharmaceutical Sciences (AAPS) PharmSci 360 conference last week, seeking to learn new ways to drive their respective businesses. Science Exchange CEO and Co-Founder, Elizabeth Iorns, PhD, addresses pharmaceutical executives at the AAPS PharmSci 360 panel discussion. Given that up to 50% of R&D budgets may be dedicated to outsourced projects by 2020, there was high interest in this invite-only session. The 60-minute panel discussion was followed by a closed networking reception, permitting a private space for open discussion. Panelists and audience members discussed how adopting an RDM technology platform has helped organizations achieve better returns on R&D investments. With the technology, companies are able to quickly find global service providers, allowing for early collaboration, improved contract management, and compliance transparency. Learn how the Science Exchange RDM could benefit your organization by requesting a demo at www.scienceexchange.com/enterprise.